Particularly white ones—sorry James, I know I usually rely on the universality of your name but this brief note needs to get more directed. A few weeks ago poet and Apogee editor Joey de Jesus offered the journal Rattle an important criticism about the lack of poets of color in their journal, particularly a latest issue that featured NY poets. Rattle’s initial response was aggressive and racially charged and attempted to claim that blind submissions eliminated bias. I encourage folks to spend time reading the replies to the initial encounter on Facebook, as many People of Color expressed important criticisms of the publishing industry. As poet Sharan Strange pointed out—again, the mask slips. I’d been working on another note in response to this incident, wanting to address the short sightedness of blind submissions. 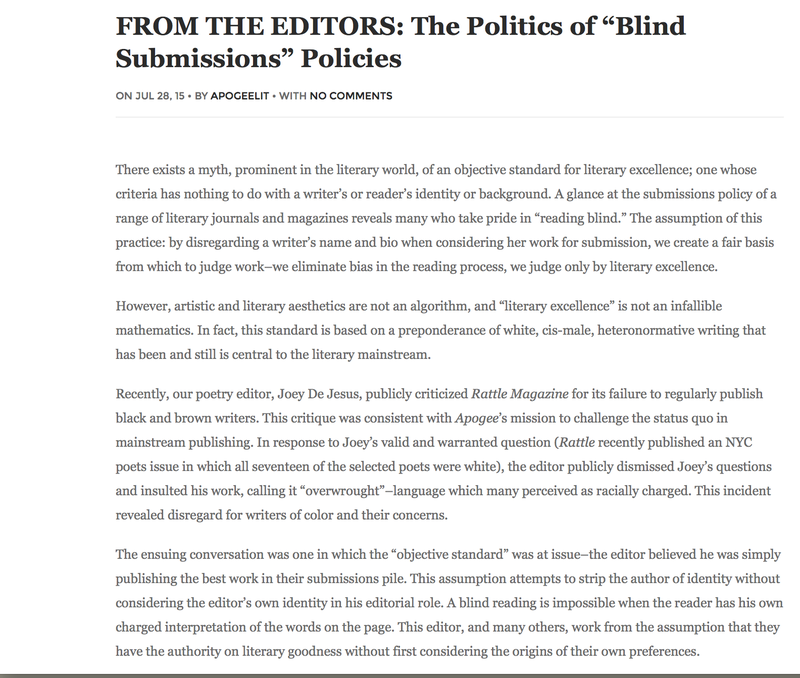 Apogee released an editorial that is deeply effective and relevant and I encourage everyone to read that instead.I leave the critique of the blind submission process to Apogee. I’ve edited down this note to keep it as brief as possible, and speak directly to white editors and artists. I echo Apogee when I state that this is larger than one white male editor’s response— biases run deep and they are expressed through publishing. After the first issue of The James Franco Review was selected I consulted with Rochelle, Erin and Nancy (after their two month stint as editors), and it was very clear that a commitment to diversity in publishing could not rely on blind submissions alone because biases run deep. Tastes are culturally formed. An editor’s job—particularly a white, straight editor—must do the work to question where their tastes come from. One evening I hosted the race council at my house […] I have a strong memory of “talking” with a young man named Sylvester. He was shouting at me “you’re racist!” I was shouting back, “no, I’m not!” “Yes, you are!” “No, I’m not!” Our “conversation” proceeded in this manner until a moment came when I told him I had to fetch the refreshments. This same exchange doesn’t stop if you are an editor. Just as dismantling and confronting one’s own racism is a constant and at times muscular act—the same calisthenics and repatterning must go into who you are as an artist, and most crucially as a gatekeeper. My queerness, my dykey characters, does not mean that I’m only to fight for that visibility in literature. When I call editors to action, white editors in particular, I mean that you can make significant changes to your journal and press. Read work by people of color, diversify your masthead and advisory board, if you have full selection power look into why people of color aren’t in that role, you can even radically change your submission and solicitation process. Otherwise you’ll be left behind. And not in the fun apocalypse way, but in that used bookstore way when you find an old lit journal that claims to have been contemporary but there’s nothing in those pages that actually speak to the time those people lived. Instead of reflecting culture, you’ll just continue to reflect an indifferent, blind world. Blind submissions won’t grant you a free pass in confronting the racism, sexism and homophobia in this labor of love industry. Reading with awareness of your bias helps. Questioning your position of power and how you got there, a start. Tags: Apogee, Dear James, diverse books, publishing, Rattle. Bookmark the permalink.